One of the most basic needs we have in many emergency situations is clean water. Water to drink, cook with, and clean with. It is hard to imagine life without clean water coming out of our tap, but it really wouldn’t take much to disrupt or contaminate a water supply. A quality water filter is one of the more important pieces of survival equipment, and as part of our National Preparedness Month celebration, LPC Survival (aka The Berkey Guy) has generously donated a Royal Berkey water filtration system for me to give to one of my amazing readers. The Royal Berkey holds an impressive 3.25 gallons of filtered water–perfect for a family or small group. This is a gravity fed filter, which means you can fill the top at night, go to bed, and have plenty of filtered water in the morning without having to manually pump it through the filter (of course it can filter any time of the day–while you’re doing something else). It measures 9.5″ in diameter and 23″ high, and isn’t that stainless finish on the Berkey filters just so nice to look at (and clean)? Besides being lovely, Berkey also has one of the best filtration systems in the industry. The Royal Berkey® system removes pathogenic bacteria, cysts and parasites entirely and extracts harmful chemicals such as herbicides, pesticides, VOCs, organic solvents, radon 222 and trihalomethanes. It also reduces nitrates, nitrites and unhealthy minerals such as lead and mercury. This system is so powerful it can remove red food coloring from water without removing the beneficial minerals your body needs. Virtually no other system can duplicate this performance. For more detailed information on exactly what these filters remove, see this page. The black Berkey filters are self-sterilizing and they can be cleaned when they the filtration rate begins to slow down. A set of two filters (each system uses two at once) will last for 6,000 gallons! That’s approximately 4 years of use (at a rate of 4 gallons/day) from one set of filters. Do you want to win a Royal Berkey filtration system of your own? Subscribe to my email newsletter for updates and special deals. Please be sure to follow Food Storage and Survival on Facebook which is updated every time there is a new article. 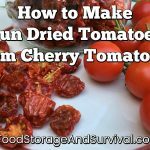 You can also find me on Pinterest, and purchase my book, Food Storage for Self Sufficiency and Survival on Amazon. Shop the Thrive Monthly Specials or my favorites, the freeze dried vegetables and yogurt bites! I’d love Berkey! But their site also has Tattler lids which would be great. Pretty sweet giveaway, I entered all the ways so hopefully I win! Fingers crossed! What an awesome give a way. I’ve wanted to add a Berkey to our supplies for years now, even more so since we recently found out our well is over 400 feet deep! I would LOVE to a Berkey Water Filter. In fact I’ve wanted one for years, but I’m a poor student so I can’t afford one yet. I visited their website, and like the Berkey water bottle. Our water here is nasty tasting, and has to be filtered to be drinkable. The water bottle would be convenient for on the go. My hubby is dying to get one! This would be awesome to win! A Berkey would be great! :-) I would also like either the Tattler lids or a survival kit from LPC. I would love to win a Berkey!!!! Would love to win this Berkey system and I will also purchase the Berkey travel cup. Thanks for a great giveaway! My hubby wants one so bad!!! His bday is in October! Great giveaway! I have wanted a Berkey for a few years. I would like a grab and go kit. I would love this! What a great give away! What a great giveaway! I have been wanting a Berkey for a long time, but it seems to never be in the budget. the medic bags look really great too! I’d really like to have a Berkey but also need some of the tattler canning lids. Tattler lids! I’ve been wanting to try them (and also a big berkey)! This is a fantastic giveaway. Thanks for the chance to win!!! Thanks for the chance to win! I’ve wanted one of these for a long time! Great idea for a giveaway! I am so excited about this! I want a Burkey so bad!! 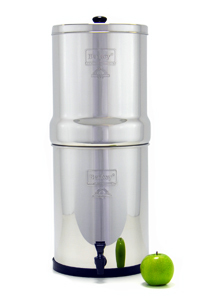 ive been looking for a good water purifier…and i have landed on a berkey! would be awesome to win!!! I subscribe to the newsletter and I already like on facebook. I would love to win one of these! I’d also like a grain mill from their site. I like the straw one. Maybe even a bladder for my shower. I’d like to see some video reviews over there. i would so love one of these! I’d love to have a collection of tattler lids. It would be spectacular to win this! Thanks to LPC for offering this as a prize and thanks to FS&S for sponsoring an awesome giveaway! I love, love, love Heirloom Seeds! Have been pining over this system, but we can’t afford it. Would be awesome to win it! I also really love the seed bank. I like the berkey pf-2 flouride and arsenic reduction elements. Need a flouride/chlorine shower filter…. I’d love to get a Sport Berkey…thanks for the contest. I’d like the Go Berkley Kit too. Wow! What a generous offer! I would love a Sport Water Bottle too, so I can have good water when traveling and visiting friends and family. Great site! Personaly, The food and grain mill would be my wish! I’d love to win a Berkey! There is lots of cool stuff on their website, but I’d have to say i’d like the heirloom seed bank. I would love to have one of their grain mills! I’ve been drooling over one of those for ages. I would love products bundled for camping with kids! I’ve wanted one of these for some time. I also visited the website, and would like the Emergency Seed Bank. Thanks so much! I love the Berkeley system. I hope I win! It’s great to see an emergency food option that’s organic…I just ordered the 40 days/nights pail last week! I’ve had an AuquRain (similar water filter)for a couple years, but it’s starting to fall apart….I wish I had gotten the Berkey. Filtration system looks great! I love your page on quick tips preparedness! great stuff. I’d love to get the Berkley water filter system. Their site also has a grain mill, which I’d love to have. I’d like to see the grain mill. The seeds would be fantastic also! We’ve only be at this for about seven months. What an addition a water filtration system would make. Thanks for doing this giveaway. What a fabulous item to give and my family and I would put it to good use! I would like the Herb seed bank, and many other things also. Any and all in this give away would be awesome! This is a great giveaway that I hope I win! There is so much stuff on their site that is awesome. That NukeAlert key chain is pretty cool. I also really like their Country Living Grain Mill, the Emergency Seed Bank, and the Organic Food Storage Bucket! This Berkey is on my wishlist. Its an amazing product! My husband and I continually argue about our water supply which filtered from a lake through municiple lines. It tastes horrible and I can smell the chlorine in it all the time. What I wouldn’t give to drink from the berkley water system. I have being contiplating the purchase of tattler lids as I am paying 4.00/ 12 for throwaways. I love the organic seeds and the fact that they are good for ten years but the grain mill rocks!!! I love my Berkey Lite and want another to use for bottling and cooking purposes! Love your website and your blog! Keep up the great work. Awesome giveaway! Would love to win!!! Definitely the Tattler lids, every year I put off buying them because of the price. Thanks for the giveaway, I want to win this so bad! Oops, I forgot to mention that I think their seed banks would be great to have on hand. I would love to get the Survive2Thrive Preparedness Pail! I would love to have the country living grain mill! I have been saving up for over a year now for a new grain mill and this one looks like a cadillac!! We’ve really been wanting a Berkey for a while now. We need a fluoride and chlorine shower filter, too. Great giveaway. I would love a Royal Berkey filtration system. In visiting LPC Survival site, I would also be interested in the emergency seed bank. Tattle Lids would be on my list! I’d like the water bottle filter. I would LOVE to win the Berkley water filter i have wanted one forever but finances dont allow me to purchase one.Thanks for the chance to possibly win one . I would like to have wise deluxe survival kit. I have a friend with a Berkey who is very happy with it and has mentioned on more than one occassion how I should get one. Thanks for the chance to win it in your giveaway! I really want the Go Berkey kit. I guess I gave a “random” blog comment so let me try this again after reading the fine print (Ok, it is BOLD and I should have known better!) :) If I could afford it, I would like a grain mill. I am gluten free and it would nice to grind my own grains right from the whole food. I’ love a set of the rotation shelves! What a great idea! The Berkey is what’s in my sights… we really need to get on water filtration. But the Tattler lids and seed banks are next on our list. I would so love to have a seed bank! I haven’t gotten to that part of my prep yet. I really need that water filter though and I didn’t win the last round……. I would like the Country Living Grain Mill in addition the the Berkey Water Filter and the Sport Water Bottle. I signed up for the newletter, but it does not show up on the little scorecard above. PP, after you click “do it” for each option, you should be able to click the green button at the bottom of that section and it will record your entry. It’s a little confusing sometimes. I’m not sure I love this rafflecopter form, but it sure is easy to use and moderate–much easier than my other forms I used for giveaways in the past. Wow, a Berkey is a fabulous prize – one anyone would love to own, including me! I would also like to have the Sport Berkey water bottle. I’d like the travel cup as well, but all are cool products. I would like one of the seed banks or the food storage options. GMOs are destroying our food supply. I want a Berkley Water Filtration System and the fluoride filter too. What a great give-a-away! I also like the Doom and Bloom mini trauma bag. I want the Black Berkey elements! I would love to have their sport Berkey water bottle! I would really love to win, I’ve been wanting one of these for a while! Thanks! Would love to have a Berkey and the Tattler lids. I also want a country living grain mill! I had no idea they carried so many things. I’m saving up for a Global Sun Oven! I SO want one of these!! Thanks for the chance!! Tattler lids would be nice. I would enjoy the solar oven! We have been preparing for emergencies. Starting supplies, canned goods, dehydrated foods, seeds etc. We haven’t yet gotten to water storage or purification. Love your seed storage & canning supplies! So many great things on the site! I think the sports bottle is my favorite. I would love to have the grain and seed mill! Great giveaway! I need one of these! I would love a seed bank, or a trauma kit. Would love a Berkey water filter. It’s hard to choose a favorite with so many great options, but I probably would choose the water bottle. Thank you, it would be great to have one of these! We have terrible tasting water where we live. I hope using a berkey would help the taste. I love that the Berkey removes fluoride from water! So important to.avoid as much fluoride as possible to be healthy. I’d love the Berkey. I’d also love to start getting some of the Wise foods to stock up for that unknown emergency. I really need one of these, it’s the gaping hole in my prepping! I would love to have one of the lpc trauma kits or the tattler lids. It’s hard to find anything on the LPC site that I don’t want! I would especially like the seed banks and tattler canning lids. I would love a Berkey! They have a lot of great things on the LPC site, other things I’d like are the Volcano grill or Grab & Go Kit. I did sign up for their newsletter. Love the Trauma Medic Bags! Also the tattler lids! What a great site. I would love a Country Living grain mill! I’d love to try some heirloom seeds and learn how to harvest my own seeds. Thanks for this giveaway, I didn’t know a filter with these capabilities existed. Incredible! I would LOVE the Country Living Grain Mill. I think the Safe Harvest Seed Bank would be great, and would make a great gift. Would love some Preparedness Books. Most of the books I have come across with the most comprehensive info is on cd or dvd format, which won’t help if we have to bug out or lose electricity! Also, seed banks and food storage are vital too! I would love the flouride and chlorine shower filter too! I could just the “poke with a pin” method because I WANT IT ALL. I particularly want a Berkley filtration system large enought to handle large groups. I have been wanting a berkey filtration system for the last 6 months or so, for emergency needs and everyday use. Another item on their site that I’ve had my eye on is the country living grain mill. I have a small hand mill that takes an incredible amount of effort so someday I’d like to give this grain mill and try. Thanks for the giveaway! I’d like a water safety test kit! Love the heritage seed storage and the tater lids but also have my eye on the ‘city water tester’ and the books on preparedness…this site is like the Christmas Catalogue for preppers. I would LOVE to have the grain mill!! The Grain & Seed Mill. It would be great to have my own. I didn’t see the grain mill. Where is everyone seeing that? That was interesting reading as to why they can’t ship to California. Looks like a real bureaucratic mess with lots of lawyers involved. Start your Amazon shopping here and help support this site at no extra cost to you!